Assistant District Engineer Linda Clark of MoDOT presided over the ceremonies, which included Congressman Emanuel Cleaver II, plus a number of state, county, and city officials, and well over a hundred walkers and cyclists. 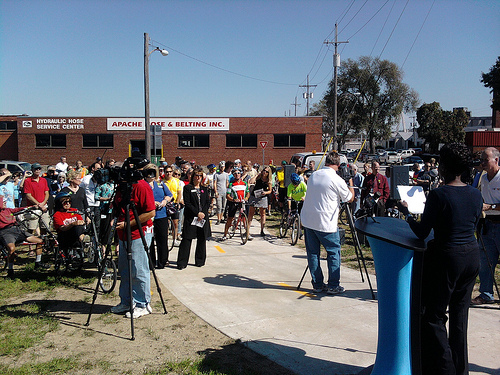 A new bike/ped pathway on the Heart of America Bridge across the Missouri River was dedicated on October 1, 2010. The project has been on the wish list of local cyclists and walkers for many years, and its construction was accelerated using American Recovery and Reinvestment Act (federal stimulus) money. What’s the transit connection? For starters, people from south of the river who work an evening shift in North Kansas City can now take transit to work and have a safe way to get back across the river after transit service ends. The KCATA's walk/bike "wrapped" bus made a cameo drive-by appearance during the HOA Bridge ped/bike pathway dedication. This photo was taken later in the day near Union Station. Thanks to our close working relationship, Transit Action Network was able to get the ATA to assign their special “Walk There / Bike There” bus to Route 142 so it would pass by (cue the cheers and waves) during the dedication ceremony. Our thanks to Cindy Baker and her colleagues at the ATA who made this “cameo appearance” possible. 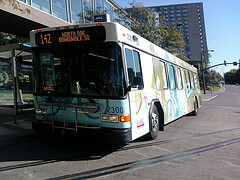 This entry was posted on October 2, 2010 at 2:39 PM	and is filed under Local Transit Issues. Tagged: KCATA. You can follow any responses to this entry through the RSS 2.0 feed. You can leave a response, or trackback from your own site.